Marc Lievremont was a surprise choice to replace Bernard Laporte as France coach following the 2007 World Cup. He is the eldest of seven rugby playing siblings and began his playing career with Perpignan in 1988, playing for them until 1997. Lievremont was at home on the blindside flank or No.8, and made his international debut for France in 1995 against Italy. After several appearances as a replacement, Lievremont nailed down a starting spot in time for the 1999 World Cup, and was a fixture of the French side that made its way to the final. Lievremont won his last cap in that match, whilst playing his club rugby for Stade Francais. He finished his playing career in 2002 with Biarritz Olympique. Following his retirement Lievremont worked with the French Under-21s before coaching Dax to promotion to the Top 14 in 2007. In a shock move he was named as French coach ahead of the 2008 Six Nations, and pledged to play open, pragmatic rugby with the emphasis firmly on blooding new talent into the international side. He would be assisted by former team-mate Emile N'Tamack and Didier Retiere, backs and forwards coaches respectively. He kept his word during the tournament, granting debuts to several raw yet talented youngsters including Montpellier's Francois Trinh-Duc and Fulgence Ouedraogo. 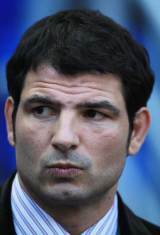 His appointment was vocally disputed by Serge Blanco, chairman of the French clubs, as being too soon and reactionary following the failure of the French side at the World Cup. Lievremont was given the job with the full backing of French Rugby Federation president Bernard Lappasset, now head of the IRB, and appears to be building a side with a view to the 2011 World Cup. He endured another mixed Six Nations in 2009, seeing his side defeat Grand Slam Champions Wales in Paris and also slip to a heavy defeat against England at Twickenham. In June 2009 he took a strong France side to New Zealand, where they won the first Test against the All Blacks 27-22 in Dunedin. In November Lievremont's side turned over the Springboks in Toulouse, but were only able to follow up the result with a heavy defeat at the hands of the All Blacks in Marseille. Their good form returned for the Six Nations, however, and Lievermont cut back on his personnel experimantation and led the team to their first Grand Slam since 2004. The following Six Nations campaign was less successful as they finished second to England. Defeats to the English and a shock loss in Italy put pressure on the French coach - pressure which only grew going into the World Cup. The cracks within the French camp turned into gaping schisms between the management and players after Lievremont publicly criticised his players following a poor performance against Japan and a shock defeat to Tonga in the pool stages. However the French, fuelled now mainly by player power, overcame England in the quarter final and then just defeated 14-man Wales in the semis. France were seen by most as surprise finalists but put in a strong showing in the final only to lose 8-7 to the All Blacks. Several senior players admitted after the tournament that they took little notice of their coach in the latter stages of the World Cup and claimed their progress was inspite of his presence rather than because of it. As planned Lievremont left his post after the World Cup and was replaced by Philippe Saint-Andre.